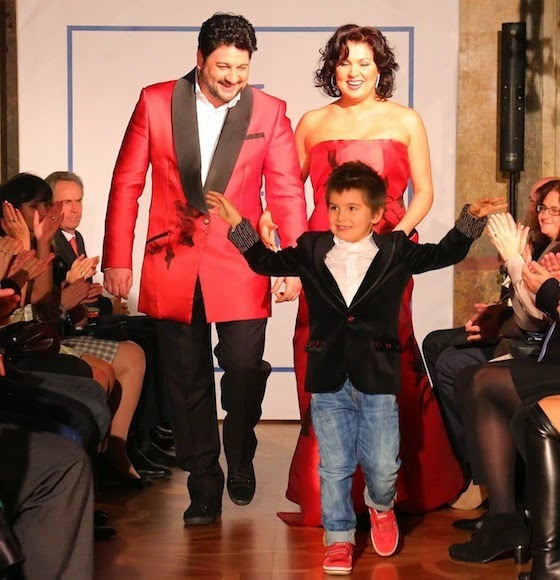 Modeling in a fashion show for friend and designer Irina Vitjaz, Anna Netrebko is joined by son Tiago and fiancé Yusif Eyvazov in Vienna. After a stroll down the catwalk, the couple is interviewed for German television. During the segment the host makes mention of fellow opera singer, Ukrainian mezzo-soprano Zoryana Kushpler, and the pending birth of her child. Without skipping a beat, she then asks the recently-engaged couple if offspring is a topic with Anna. See the video here.